I wanted to get a film review up on this blog in time for Halloween. But which stereoscopic movie to choose? There are of course the usual 3-D horror offerings; Friday the 13th Part 3 in 3-D, Amityville 3-D, even Flesh For Frankenstein. But no, it needs to be more unique then those. I want to dig deep, so deep that I could unearth the rarest of 3-D horror offerings. 1984’s Silent Madness might do, but it needs to be more than just the familiar slasher flick. I think I’ve found the rarest of the rare in the 1984 anthology film. A film so rare that it has only been available once on home video, in 1998 as part of the EO Studios 25th Anniversary VHS collection. This now out of print tape could only be ordered directly from the studio that made it. 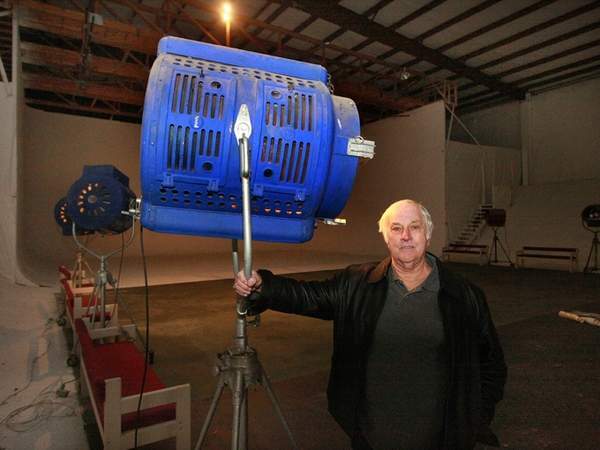 The film is Tales of the Third Dimension and the studio is EO Studios home of North Carolina film producer Earl Owensby. Owensby today; 74 years young. Earl Owensby is a self-made filmmaker. After military service as a marine and a successful business career Owensby was bitten by the movie making bug and setup shop in his hometown of Shelby N.C. His first foray into the movie business was Challenge (1974), a Walking Tall (1973) inspired revenge flick in which he also starred. Often dubbed the “redneck Roger Corman” (although he most likely prefers the description G.Q Magazine used; “the Dixie DeMille”), Owensby’s films often played the bible belt drive-in circuit and became a training ground for North Carolinian filmmakers Worth Keeter and Thom McIntyre. All of who contribute to Tales of the Third Dimension. While E.O. Studios films often suffer from a lack of polish due to their budgetary constraints, I always find them extremely entertaining, which is all they attempt to be. After seeing Tony Anthony’s 3-D spaghetti western Comin’ at Ya in 1982, Owensby purchased a number of Stereovision lens made by Chris Condon, and declared that his studio would produce all it’s films in 3-D. He started with the successful Rottweiler: Dogs of Hell (1982), a sort of Jaws clone with genetically enhanced rottweilers standing in for the Great White. Owensby also starred, as a small town sheriff charged with protecting his town. Owensby came close to his promise and would produce six more films in the third dimension, only his last film of the era, The Rutherford County Line (1987). Classic comedy team Laurel & Hardy? Tales of the Third Dimension is an anthology film, very much in the tradition of Amicus Productions’ Tales from the Crypt (1972). It’s EC Comics influences are also front and center. 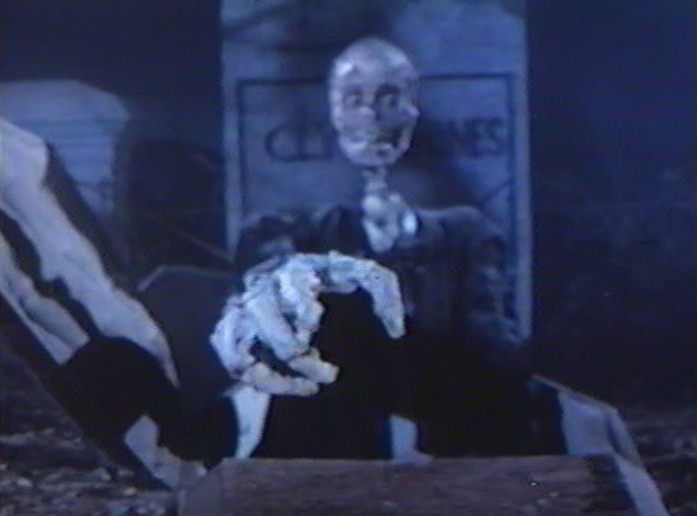 The film’s three segments are hosted by Igor (although his tombstone reads Clyde Jones), a living corpse who speaks in Rod Sterling’s voice. During his tongue in cheek introductions a group of vultures cat call from the sidelines. 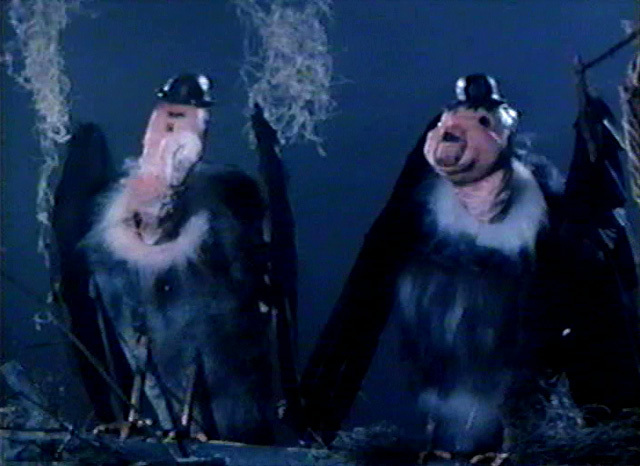 The 3 Stooges, in vulture form. 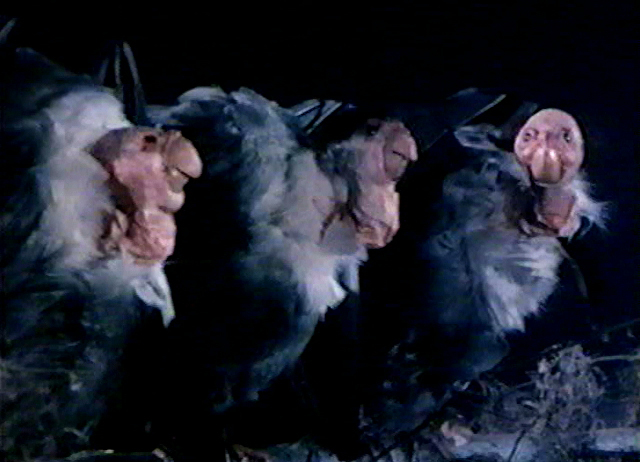 These buzzards, rod puppets with little more than a mouth for movement, caricature the classic comedy teams Laurel and Hardy, and the Three Stooges (Larry, Shemp and Moe). These sequences, filled with blue light and fog, effectively copy the old EC Comics horror hosts although the pace is decidedly slow and the puppetry of all the characters very stiff. While the film is a collaboration of E.O. Studios directors, Earl Owensby himself is credited with directing this wrap-around material, his only directing credit. Igor: built by Photo Lab of Charlotte owner Harry Joyner. In these sequences Owensby takes every advantage to to utilize screen piercing 3-D effects. As Igor exclaims “case in point” as his skeletal hand floats out over the audience. Owensby has another odd connection to the world of stereoscopic movies. James Cameron, director of the recent 3-D epic Avatar, shot an equally epic production at Owensby’s studios. The Abyss’ underwater sequences were shot an uncompleted nuclear reactor which was owned by Owensby and his studios. You have to wonder if Cameron ever consulted Owensby about the stereoscopic process?